You know summer is gone and fall is here when you put on a dress, take pictures and your legs are WHITE. And not just a little white, a lot white!! So needless to say, buying tights will be in my future if I am ever going to wear a knee length dress again! This dress was given to me by my sister and I knew that I wanted to pair it with my red heels I found thrifting. I love that the dress has a 50's flare to it and all the lace detail. 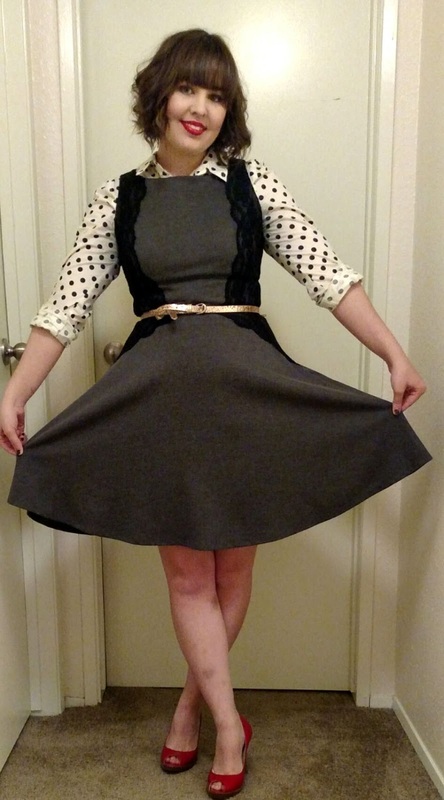 Because of the cooler temps and the fact that I did not have a sweater that I wanted to pair with this outfit, I went with putting a button up under the dress instead. It is an easy way to add a little something else to an outfit and also stay on the warmer side.